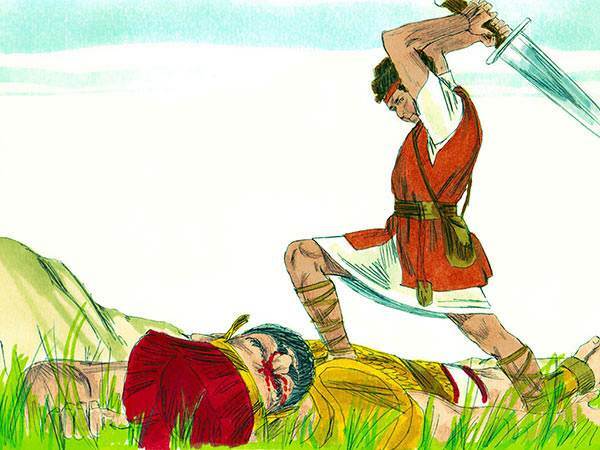 One of the most interesting stories in the Bible is the story of David and Goliath. It is found in 1 Samuel chapter 17. The amazing thing about the Bible is that regardless of how many times we read a story, there are always other things that can be gleaned from it if we ask the Lord for more understanding concerning the truths that are hidden in it. 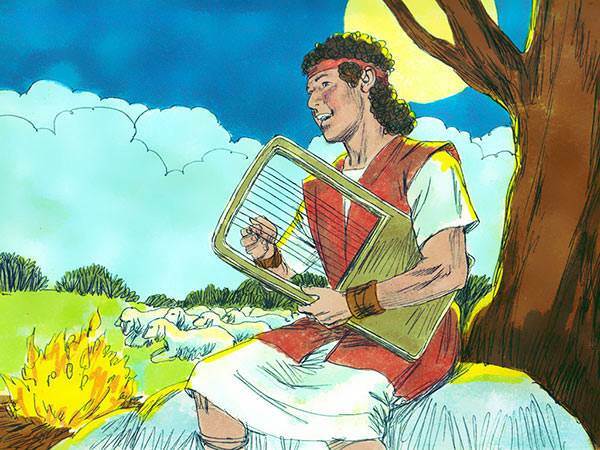 The hero of this story is David, who was said to be "a person after God's own heart." This phrase means "one with whom God is pleased." If we can understand what it is that God is pleased with, this series should be a worthwhile adventure. Each of us has behaviour patterns based on the way we think; and the way we think is tied into what is going on in our heart. The "heart" in my opinion is that very important part of us that causes us to love, hate, choose, and desire. A person after God's own heart then, is one who loves the things that God loves, hates the things that God hates, chooses the things that God would choose, and desires the things that God desires. 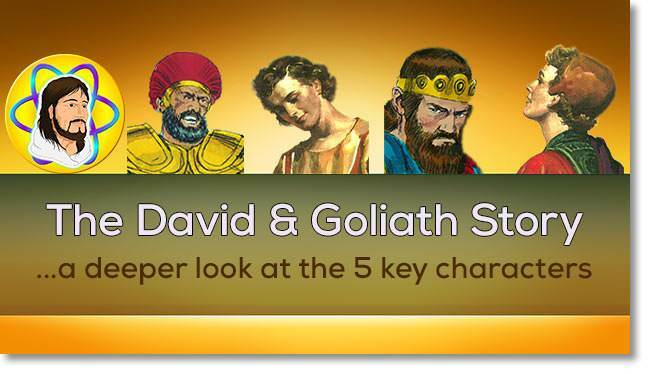 In this short course I want to look at the remaining four characters involved in the story of David & Goliath (we already looked at "God" in Lesson 1). Somewhere in the philosophy of these characters we might be able to see ourselves and what it is that makes us behave as we do. God's Word says, "As a man thinks in His heart, so is he" (Proverbs 23:7). Consider what is going on in the heart of these individuals. The first character that I would like us to look at is Goliath. The first thing that you will read about him in 1 Samuel Chapter 17 verse 3 is how big he is. Apparently, he was nine feet, three inches (2.8 meters) tall. No wonder they called him a giant! He was not only a big man but he also wanted everyone to know how big he was. 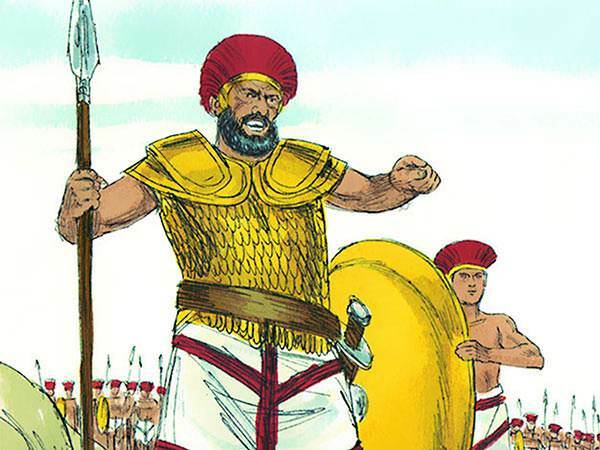 I wonder how many times he let people know that he was the biggest man in the whole Philistine army. It reminds us of some of the football players today when they make a sack, or the wrestlers when they become champions, or the world boxing champions when they have a T.K.O. "I'm the greatest" seems to be what even the little fellows like to say when they win their game. How do you get to be the greatest? Many have asked themselves that question. There are many different ways to be the greatest, and some would like to be the greatest in different ways than others. If you want to become financially the greatest, become the richest man in the world. Physically the greatest, become the world boxing champion. Politically the greatest, become the president. Educationally the greatest, get a doctorate. The most beautiful, win the Miss Universe Contest. One of the problems with trying to be the greatest is that you can never be sure you are because someone else may be in the process of becoming greater. There is nothing wrong with seeking to do well and wanting to be successful, but when our eyes are on our greatness we could be heading for a fall. Some have even considered themselves to be greater than God, and therefore have no need of Him, and even declared Him dead. What a surprise these people will have when they meet Him face to face and see how great He is. Goliath had a big fall and it came from an unlikely source. It was a real surprise, and he never recovered! Be great if you can, but do not count on your greatness. The second thing that we read about Goliath is how secure he is. The Bible says that he wore a suit of armour, made of brass. It weighed one hundred and fifty pounds (68 kg). His spearhead weighed nineteen pounds (8.6 kg), and one bearing a shield went before him. He was not only the biggest but also considered himself the most secure. If a person has no security but his own security, he better have lots of it. Goliath apparently ended up not having enough. He had a false view of himself. 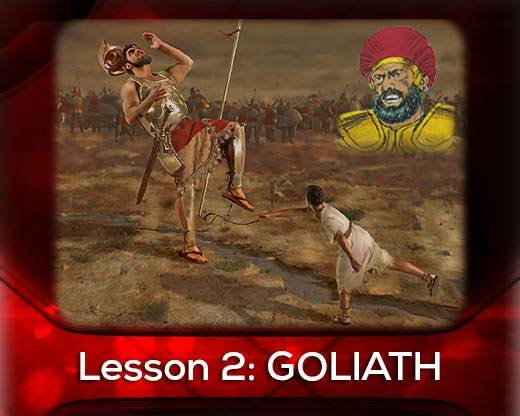 Interestingly, it would appear that at times Goliath suffered from a superiority complex when he thought he was secure and that nobody could touch him, and yet at other times he suffered from an inferiority complex and decided that he better thicken up his armour because someone might defeat him. Otherwise why would anyone carry around all that armour if he felt so secure? Do you know anyone who suffers from a superiority complex one minute and an inferiority complex the next? I am afraid I do, and the answer doesn't seem to lie in being the greatest. David didn't seem to have this problem. I wonder why? What must God have thought as He watched Goliath thinking he was so big and secure? He must have laughed at how Goliath had such a high opinion of himself. 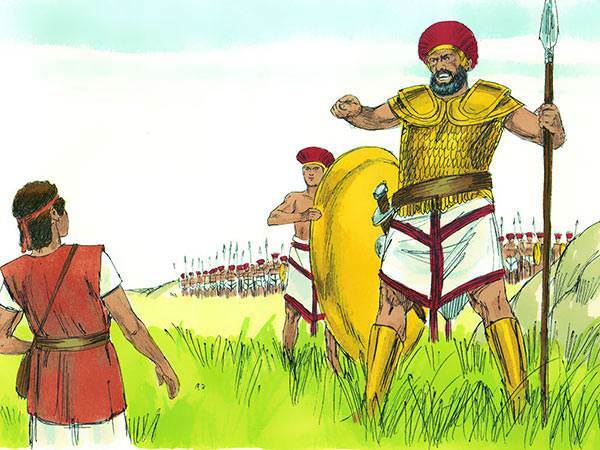 The third thing that we learn about Goliath in 1 Samuel chapter seventeen is the way he does things. In verses 8 and 9 he asks Israel to send a man down to fight with him. As far as Goliath is concerned it is a "dog-eat-dog" world. Might is right, and he might as well get others before they get him. Self is on the throne of his life and it shows up in the way he talks and the way he behaves. Goliath lives for no one but himself. He knows nothing about God—His greatness, His protection, and His way of doing things. Probably he could have learned if only he was teachable but he was too self sufficient. The fourth revelation of Goliath's character is found in verse forty-four of the same chapter. Here he tells David, "Come to me, and I will give your flesh to the fowls of the air." In other words, I will feed you to the birds. Have you ever heard that expression before? This is where it comes from. Goliath was full of pride. The Bible says that pride comes before destruction, and it certainly was true here. Pride comes when we think more of ourselves than we ought to think. 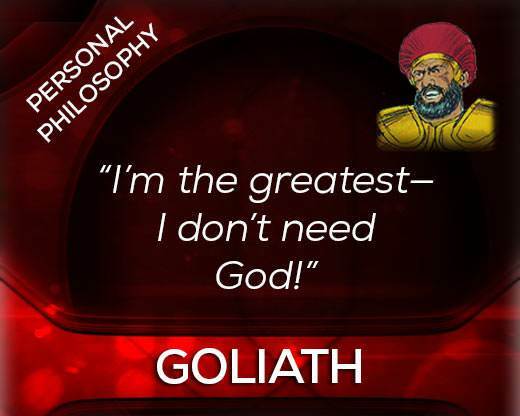 Goliath's thought pattern was: I am the greatest, I am the most secure, I can fight and beat anyone…this will be no contest! 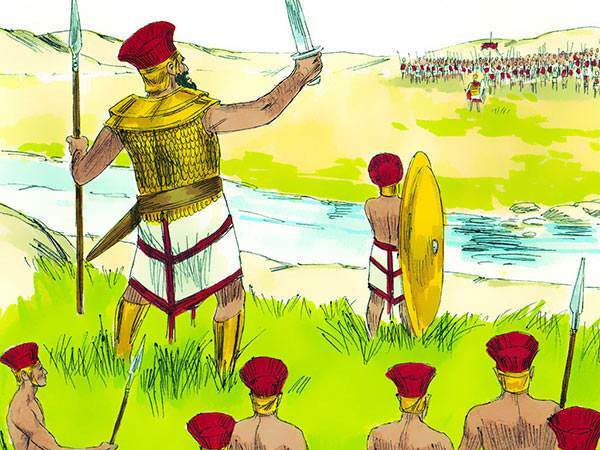 He didn't feel he needed God or even the Philistine army to help him. Goliath is a picture of a man who has turned his back on God, thinks he doesn't need Him, and can solve all his problems without Him. In this course I said there would be the story of five characters. This is the second one. I hope he isn't a picture of you; but if he is, then the question could be asked, "What is the answer to his problem?" Goliath needed to see how small he was in God's eyes, humble himself before God and ask for forgiveness. In today's world he should ask Jesus to save him from his sins and change his way of thinking about himself. For a big person this type of humbling is almost impossible unless he has major problems come into his life such as a major financial loss, great sickness, or a bad accident. 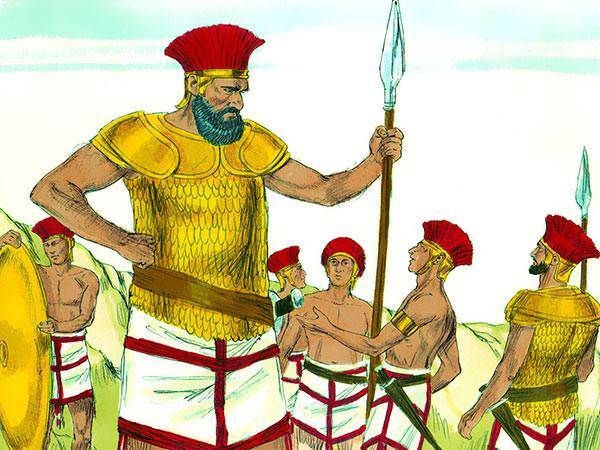 It is amazing how many Goliaths there are in this world and usually it is because they haven't been encouraged to put their faith and trust in God when they were young, see their need of the Saviour and rely on Him. The end of Goliath is sad and yet he brought it on himself due to his lack of humility and unwillingness to see himself as he really was. Many may wonder why they spend eternity separated from God, and it will be because they—like Goliath—rejected God, and what He has done for them. If you don't need God here, you won't have Him in eternity.